Bush administration hopes economic summit will reassure citizens. How to access the full article: Free access to all articles is available courtesy of your local library. To access the full article click the “See the full article” button below. CRAWFORD, Texas _ Hoping to reassure Americans that his administration has a firm grasp of the country’s economic struggles, President Bush is interrupting his vacation Tuesday to convene an elaborate meeting of business executives and a sprinkling of blue-collar workers to give the White House a first-hand account of the state of the nation’s economy. While the public still expresses faith in the Bush administration’s ability to handle national security, Republicans are growing increasingly nervous about the political effects of a sputtering economy and are eager to portray the president as deeply involved in achieving a swift recovery. Streatham Court, Rennes Drive, Exeter EX4 4PU, England, UK. and, in turn, reduces the incentives for agents to participate in productive activities. variables that have been tried, and their sources, can be found in the appendix. incomes by a staggering 400 percent (World Bank, 2004). natural resource exports has a positive effect on perceived corruption. The vote by the House of Representatives today against the bailout bill was one of the worst mistakes I have ever seen the Congress make. It was shockingly irresponsible. Yes, it is true that Americans are deeply offended by the idea of this bailout and yes, it is inconsistent with principles of a country that believes in free enterprise. But it represents an urgent and temporary intervention by the only institution in our country that can stabilize the financial markets and head off a potential calamity for millions of Americans. Every Member who voted against the bill today should be held personally responsible at the polls this November if people are badly hurt by this. In the meantime, one can only devoutly hope that our political leaders on both sides of the aisle can resurrect this bill and get it — or a close cousin — passed immediately. This is a dangerous moment for America. This entry was posted on Monday, September 29th, 2008 at 6:43 pm	and is filed under David Gergen. You can follow any responses to this entry through the RSS 2.0 feed. Responses are currently closed, but you can trackback from your own site. So, I guess they get to decide for all of us whether socialism is okay or not. Apparently, they can also use their time and efforts to influence public opinion in big and small blogging ways like on AC 360, isn’t that cnn.com? And we all just ignore every principle that President Kennedy damn near blew Cuba out of the water over and Cuba damn near blew us to hell over? What kind of people are running that place over at Harvard? In fact, isn’t the Harvard business school pros the ones that gave us the credit default swaps and financial derivatives in the first place? Jill E. Sommers was sworn in as a Commissioner of the Commodity Futures Trading Commission on August 8, 2007 to a term that expires April 13, 2009. On February 4, 2008 the Commission appointed Commissioner Sommers to serve as Chairman and Designated Federal Official of the Global Markets Advisory Committee, which meets periodically to discuss issues of concern to exchanges, firms, market users and the Commission regarding the regulatory challenges of a global marketplace. Commissioner Sommers has worked in the commodity futures and options industry in a variety of capacities throughout her career. In 2005 she was the Policy Director and Head of Government Affairs for the International Swaps and Derivatives Association, where she worked on a number of over-the-counter derivatives issues. Prior to that, Ms. Sommers worked in the Government Affairs Office of the Chicago Mercantile Exchange (CME), where she was instrumental in overseeing regulatory and legislative affairs for the exchange. During her tenure with the CME, she had the opportunity to work closely with congressional staff drafting the Commodity Futures Modernization Act of 2000. Commissioner Sommers started her career in Washington in 1991 as an intern for Senator Robert J. Dole (R-KS), working in various capacities until 1995. She later worked as a legislative aide for two consulting firms specializing in agricultural issues, Clark & Muldoon, P.C. and Taggart and Associates. Bart Chilton was sworn in as CFTC Commissioner on August 8, 2007. He was formerly the Chief of Staff and Vice President for Government Relations at the National Farmers Union – one of the oldest and largest trade associations. In 2005, Mr. Chilton was a Schedule C political appointee of President Bush at the U.S. Farm Credit Administration where he served as an Executive Assistant to the Board. From 2001 – 2005, Mr. Chilton was a Senior Advisor to Senator Tom Daschle, the Democrat Leader of the United States Senate where he worked on myriad issues including, but not limited to, agriculture and transportation policy. From 1995 – 2001, Mr. Chilton was a Schedule C political appointee of President Clinton where he rose to Deputy Chief of Staff to the U.S. Secretary of Agriculture Dan Glickman. In this role, Chilton became a member of the Senior Executive Service (SES) – government executives selected for their leadership qualifications to serve in the key positions just below the top Presidential appointees. As an SES member, Chilton served as a major link between Secretary Glickman and the rest of the Federal work force at USDA. From 1985 – 1995, Mr. Chilton worked in the U.S. House of Representatives as Legislative Director for three different Members of Congress on Capitol Hill. Every four years, just after the Presidential election, the “United States Government Policy and Supporting Positions” is published. It is commonly known as the Plum Book and is alternately published between the House and Senate. The Plum Book is a listing of over 9,000 civil service leadership and support positions (filled and vacant) in the Legislative and Executive branches of the Federal Government that may be subject to noncompetitive appointments. These positions include agency heads and their immediate subordinates, policy executives and advisors, and aides who report to these officials. Many positions have duties which support Administration policies and programs. The people holding these positions usually have a close and confidential relationship with the agency head or other key officials. The Plum Book is available online at http://www.gpoaccess.gov/plumbook/index.html. “What is the SES?” The Senior Executive Service (SES) is comprised of the men and women charged with leading the continuing transformation of our government. This dedicated corps of executives shares a commitment to public service and a set of democratic values grounded in the fundamental ideals of the Constitution. As the leaders of our Federal civilian workforce, Senior Executives strive each day to create a more citizen centered, result oriented Federal Government. Learn more about how executive positions are filled! Click on the links below to find out more. The Civil Service Reform Act (CSRA) established the Senior Executive Service (SES) in 1979. It was set up as a “third” service, completely separate from the existing competitive and excepted services. Career status in the SES does not confer eligibility for appointment in the competitive service. The purpose of the SES is to ensure that the executive management of the Government is responsive to the needs, policies, and goals of the nation and otherwise of the highest quality. To achieve this purpose, the CSRA provided greater authority to agencies in managing their executive resources. The committee met, pursuant to call, at 10:00 a.m., in room 2128, Rayburn House Office Building, Hon. James A. Leach, [chairman of the committee], presiding. Present: Chairman Leach; Representatives Roukema, Baker, Biggert, Terry, Toomey, LaFalce, Kanjorski, Waters, C. Maloney of New York, Watt, Bentsen, Sherman, and Lee. Chairman LEACH. The hearing will come to order. Today’s hearings will address three areas—over-the-counter derivatives; hedge funds; and contract netting—where legislative proposals are pending to reduce systemic risk to the financial markets. The legislation, in each case, is based upon recommendations from the President’s Working Group on Financial Markets. The Working Group, which consists of the Secretary of the Treasury and Chairmen of the Federal Reserve, the Securities and Exchange Commission, and the Commodity Futures Trading Commission, has creatively examined system-wide issues across the legalistic and jurisdictional divides that normally separate one regulator’s thinking from another’s. The Working Group’s newly established and long overdue consensus on OTC derivatives is momentous for the banking industry, banking regulators and this committee. An overwhelming majority of financial OTC derivatives transactions involve one or more banks. Not only do the largest commercial banks conduct most of the dealer activities for financial swaps or related derivatives, but banks and other financial institutions of all kinds and sizes are the largest-scale end-users of these contracts. OTC derivatives, particularly interest-rate, foreign exchange, and credit derivatives, have become essential to risk management strategies, proprietary trading activities, international operations, and services to institutional customers. For these reasons, this committee has had a vigorous and sustained interest in derivatives issues for well over a decade. In 1993, the then-committee Minority issued what remains the most comprehensive analysis of over-the-counter derivatives ever produced in Congress. Many of the issues addressed in the Working Group’s 1999 report were raised in that report. The above picture was taken from a brochure published by the Phi Beta Kappa Society, 1606 New Hampshire Ave. NW, Washington, DC 20009. Telephone: (202)-265-3808, Fax: (202)-986-1601. Paulson received his Bachelor of Arts in English from Dartmouth College in 1968; at Dartmouth he was a member of Phi Beta Kappa and was an All Ivy, All East, and honorable mention All American as an offensive lineman. Paulson was Staff Assistant to the Assistant Secretary of Defense at The Pentagon from 1970 to 1972. He then worked for the administration of U.S. President Richard Nixon, serving as assistant to John Ehrlichman from 1972 to 1973. The Key Reporter (ISSN: 0023-0804) is the national member publication of the Phi Beta Kappa Society. Published quarterly, The Key Reporter includes news and stories about Phi Beta Kappa events, programs, awards, members in the news and reviews from our book critics. The American Scholar, a national quarterly magazine of literature, history, science, public affairs and culture, has been published for the general reader by the Phi Beta Kappa Society since 1932. In recent years it has won four prestigious National Magazine Awards, and many of its essays have been selected for the Best American anthologies. Phi Beta Kappa alumni associations exist in many areas of the United States and membership is open to anyone elected to Phi Beta Kappa. The associations exist to foster friendship and learning in their communities, and they provide a means for members to continue their active affiliation with the Society after graduation. Today, there are more than 58 active associations. To find an association near you, go to the Association Directory or the Associations Map. 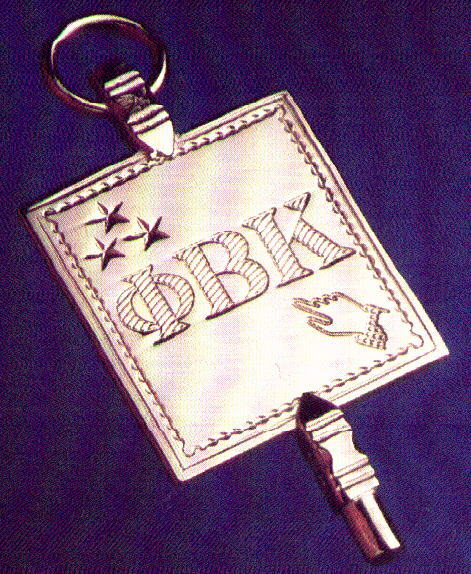 The first Phi Beta Kappa association was established in New York City in 1877. Since that time, associations have been formed in various regions of the country and in metropolitan areas. At different times in the past, associations were also active in other countries. The Society’s Triennial Councils include a Conference of Association Delegates. The secretary and chair of this group, ex officio members of the Committee on Associations, serve as the Associations’ representatives to the Phi Beta Kappa Senate. Paulson’s three immediate predecessors as CEO of Goldman Sachs — Jon Corzine, Stephen Friedman, and Robert Rubin — each left the company to serve in government: Corzine as a U.S. Senator (later Governor of New Jersey), Friedman as chairman of the National Economic Council (later chairman of the President’s Foreign Intelligence Advisory Board) under President George W. Bush, and Rubin as both chairman of the NEC and later Treasury Secretary under President Bill Clinton. Even after our people leave Goldman Sachs, they still identify with the firm and we want to foster that connection. We have a rich history and tradition, and we invest in it. Our alumni help us recruit. They participate in volunteer activities. They come back to speak to our people, and they do business with us. Not only does this help validate our culture, it provides a real, tangible value that transcends any single generation. Goldman Sachs to Become the Fourth Largest Bank Holding Company. If you would like to contact the Office of Alumni Relations please e-mail alumnirelations@gs.com or call 1.212.902.1110. From 1994 to 1999, Mr. Bolten was Executive Director, Legal & Government Affairs, for Goldman Sachs International in London. Pelosi has also served on the Committee on Standards of Official Conduct (Ethics) and the Banking and Financial Services Committee. She has chaired the Congressional Working Group on China and has served on the Executive Committee of the Democratic Study Group. Since 1987, Nancy Pelosi has represented California’s Eighth District in the House of Representatives. The Eighth District includes most of the City of San Francisco including Golden Gate Park, Fisherman’s Wharf, Chinatown, and many of the diverse neighborhoods that make San Francisco a vibrant and prosperous community. As a member of the House Permanent Select Committee on Intelligence for 10 years (the longest continuous period of service in the committee’s history) including two years as the Ranking Democrat, Pelosi worked to ensure that policymakers and military commanders are provided with the timely and accurate intelligence necessary to guide diplomatic initiatives, succeed in combat, and protect U.S. military forces. In meetings around the world with U.S. and foreign intelligence leaders, Pelosi has urged for greater attention to the threats to international security posed by the proliferation of technologies associated with the weapons of mass destruction and global terrorism. Pelosi hails from a strong family tradition of public service. Her father, Thomas D’Alesandro, Jr., served as Mayor of Baltimore for 12 years, after representing the city for five terms in Congress. Her brother, Thomas D’Alesandro III, also served as Mayor of Baltimore. The Pelosi family has a net worth of nearly $19 million as of 2007, primarily from investments. In addition to their large portfolio of jointly owned San Francisco Bay Area real estate, the couple also owns a vineyard in St. Helena, California, valued at $5 million to $25 million. Pelosi’s husband also owns stock, including $5 million in Apple Computer. Pelosi continues to be among the richest members of Congress. elosi is regarded as a liberal, in part because she represents most of San Francisco, well known for its tradition of left-leaning politics. She consistently receives high ratings from liberal lobbying groups such as Americans for Democratic Action and People for the American Way, and she has a lifetime rating of 3 from the right-leaning American Conservative Union. During the 2004 and 2006 election cycles, Republicans frequently used the prospect of a “San Francisco liberal” or “Bay Area liberal” becoming Speaker as a tool to win votes, especially in the South. She was a founding member of the Congressional Progressive Caucus, but left in 2003 after being elected Minority Leader. She felt that it would be inappropriate for her to be a member of any caucuses. 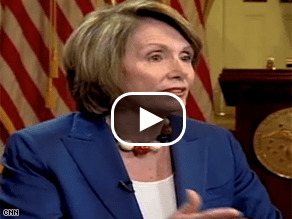 Watch portions of Pelosi’s interview with Wolf Blitzer. (CNN) — House Speaker Nancy Pelosi on Thursday called President Bush “a total failure” — among the California Democrat’s harshest assessments to date of the Commander-In-Chief. “This is not a record to be proud of and I think the American people deserve better,” Bush said. That poll showed its approval rating had reached an anemic level 14 percent — while more than 70 percent said they disapproved of the job Congress is doing. “Just because John Boehner, who is my friend, has my respect, says it, doesn’t make it so,” she responded, while reiterating she will block any vote to allow lifting the ban. I think John Boehner has certainly returned the friendship. And, I’m sure there’s more – a little collusion here and a little nepotism there and a little cronyism over yonder and then again – all that cronyism and allocation of protections, privileges, opportunities and favoritism everywhere in our top government. And, everybody just says, “well, that’s politics. what do you expect?” This inbreeding is a little much. GSA’s Office of Budget, under the Chief Financial Officer (CFO), analyzes customer and taxpayer requirements through the Performance Management Process (PMP); which sets performance goals based upon those requirements, develops action plans, and then allocates resources. This detailed financial, budgetary, and performance data provides managers with a solid foundation on which to base day-to-day management decisions. The continual PMP cycle unites the GSA Strategic Plan, the President’s Management Agenda (PMA), the Program Assessment Rating Tool (PART), Business-Line/Program Area performance goals and measures, and other management tools. The PMP fully supports the GPRA and is ensuring that GSA is well positioned to achieve a successful future.